Brooke Burke Breast Implants And Nose Job? Sean Patrick Flanery Cosmetic Surgery? 10 Famous People With "Lana Lips"
Kris Jenner Swollen Upper Lip: Botched Lip Augmentation? In an effort to 'keep up' with daughter Kim, Kris Jenner (Kardashian) has once again sought the assistance of cosmetic surgery to preserve her appearance, or at least that's what the trailer for the seventh season of their reality show would lead viewers to believe. The photo seen below is a snapshot from the trailer which shows Kris laying in bed, distraught, while sporting a massively swollen upper lip. An upper lip that only Lana Del Rey would be proud to call her own. We're guessing that the swelling is attributed to an adverse reaction to injectable lip fillers. When asked by 'Today Show' host Matt Lauer if her fat lip was the result of cosmetic surgery, Kris responded with what any good promoter would say: You'll have to tune in to find out. Only revealing that her swollen lip was caused by something "really crazy". So it must be plastic surgery related! The Kardashian "momager" has previously undergone rhinoplasty surgery, as well as a televised facelift that was featured on the K-Klans reality show. Because nothing says 'reality' like slicing and stretching another human beings flesh... Mom, is dinner ready yet! Its a family program, right? I really wanted to know if she ever found the cause of what happened here. When I was in high school my mom woke up with her upper lip exactly like hers...I mean exactly, it was weird and we never got an answer to what caused it. Hers eventually went down but it did leave one side of her lip different. Ten years later and one side is a slightly different shape and larger than the other side. 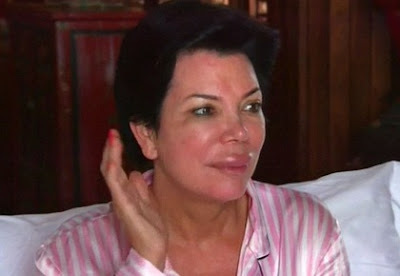 I've wondered if after this Kris had something done just because I know the shape of my moms upper lip was changed by the strange sudden swelling (I think it lasted 3 days) but I haven't noticed a changed in Jenners lip shape at all so I wonder if she had something done to correct it. I only know of the experience we went through, it made my mom look like a duck sadly. Scary, but at least she's honest about it.